Some stitching has happened in this house! I made a point of staying off of social media today and worked away at things that I love like walking, reading and stitching. Maggie and I walked on a new to us trail this morning, I finished reading "The White Queen" for my book club and started "The Battle Within" which I am reading for myself and I worked on the two ornaments on the left. 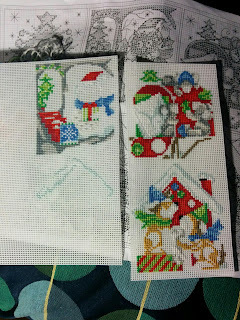 The ornaments are from a kit called "Home for Christmas" from Design Works Crafts. The fella' was busy catching up on his TV shows after we took the puppy to obedience class this morning so I puttered away. My step counter tells me that I am almost at 13 000 steps for the day, Maggie stinks like the ditch water she ran through and we are all off to bed at a decent hour. The best kind of Sunday!